The drill guides are like having a drill press for precision alignment, while the tap guides start every hole straight and helps prevent tap breakage! All the guides have a "V-Groove" on the bottom to allow you to work on corners or round surfaces. Each guide is heat treated for durability, allowing a tight tolerance. The guides work great on corners, round and flat surfaces.100% American made quality and a Lifetime Warranty on every guide. Set includes: one Standard V-DrillGuide® -(3/8-1/2"), one Standard V-DrillGuide® -(1/8-3/8"), one MINI V-DrillGuide®, one Standard V-TapGuide®, one STI-UNC V-TapGuide® (coarse threads) and one STI-UNF V-TapGuide® (fine threads). Drill guide is sized for drill bit sizes: 3/8 to 1/2". 9 drill sizes - 1/64" increments. 9 drill sizes include: 3/8, 25/64, 13/32, 27/64, 7/16, 29/64, 15/32, 31/64, 1/2". Drill guide is sized for drill bit sizes: 1/8 to 3/8". 17 drill sizes - 1/64" increments. 17 drill sizes include: 1/8, 9/64, 5/32, 11/64, 3/16, 13/64, 7/32, 15/64 1/4, 17/64, 9/32, 19/64, 5/16, 21/64, 11/32, 23/64, 3/8". 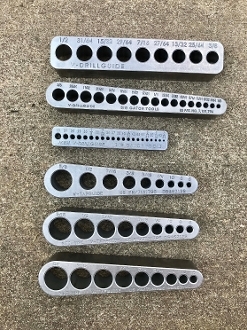 Drill guide has 21 holes: #10, 21, 25, 29, 30, 1/8", 33, 7/64", 36, 37, 38, 40, 3/32", 43, 45, 47, 5/64, 50, 1/16", 53, 3/64". 10 Unified Coarse Thread sizes: 9/16-12, 1/2-13, 7/16-14, 3/8-16, 5/6-18, 1/4-20, 12/24, 10-24, 8-32, 6-32". This guide is for Screw Thread Insert (STI) type ground taps. This guide is for Heli-coil® type ground coarse thread taps. 9 Unified Fine Thread sizes: 5/8-18, 9/16-18, 1/2-20, 7/16-20, 3/8-24, 5/6-24, 1/4-28, 10-32, 8-36". The V-TapGuide® is for Heli-coil® type ground fine thread taps. We are Prop 65 Compliant on ALL V-DrillGuides & V-TapGuides.